Whatever the season, you've got front-row seats to a wonderland. A visit to one of the two hot tubs is just what you need to recover from your day. Individual bedrooms, private kitchen, and a spacious living room – it's like they dropped your house in Steamboat. It's a 5 min shuttle ride to Steamboat Ski Resort. Get ready to hit the slopes. Downtown Steamboat Springs is only a 5 min shuttle ride away. There are two indoor hot tubs at the resort - try them both and pick your favorite. Stock up on snacks, Emerald Mountain Hiking Trail and Spring Creek Trail are a 5 min drive from the resort. Brush up on your game at Rollingstone Ranch Golf Course, just a 5 min drive from the resort. 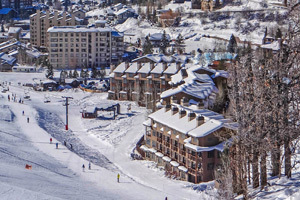 Legacy Vacation Club - Steamboat Suites is conveniently located a quick drive from the Steamboat Ski Resort lifts. Get your camera ready – the gorgeous mountain views are begging to be instagrammed. Once everyone gets settled, head for the shuttle and prepare to ski your heart out at Steamboat Ski Resort, named one of Ski Magazine’s 2017 Best in the West. Recover from the slopes in one of the two hot tubs – your muscles will thank you. On a clear-skies day, head to the outdoor grills for a family cook out. Lay out toppings and condiments and recruit the little ones to help carry hot dogs, burgers and sides. One- and two-bedroom condos are 500 to 700 square feet and sleep four to six guests. All condos have full kitchens with everything you need to show off your master-chef skills. Stock up on necessities at Safeway located just across the street from the resort. Whether you want to make lasagna from scratch or keep it low-key with a frozen pizza – no judgment, you’re on vacation! – the options are endless. All condos feature flat-screen TVs with cable, HBO and a DVD player – perfect for a chilled-out family movie night. Browse the selection of movies available for rent at the resort or bring favorites from home. Gather the kids on the couch, pop some popcorn and ask for a show of hands to decide which movie to watch first. The on-site laundry facility means one less thing to do when you get home. Take advantage of the complimentary shuttle service to Downtown Steamboat Springs, offering a variety of unique dining and shopping options. Gondola Joe’s serves baked goods, Starbucks Coffee and deli sandwiches. Grown-Ups can enjoy appetizers and cocktails at Umbrella Bar. Head to Bear River Bar & Grill for barbecue pork, chicken wings or a veggie burger. Steamboat Apparel and Gifts is the place to go for official Steamboat souvenirs and KVC Mercantile has children’s clothing and accessories. Get in touch with your inner daredevil and zoom through the skies at Steamboat Zipline Adventures. Surprise the kids with a visit to Amaze’n Steamboat Family Fun Park for a day of activities like miniature golf, bungee trampoline and a bounce house. Up for an afternoon of pampering? Rocky Mountain Day Spa has you covered. Treat yourself to a relaxing massage, facial or manicure. Children aged four to ten will love the Little Diva manicure or pedicure. - Front desk is open 7:00 AM-11:00 PM daily. Guests that are planning to arrive after hours must contact the property using information on the booking confirmation. Kids stay free! Up to 6 children 18 years old and younger stay free when using existing bedding.